EghtesadOnline: The UK is pursuing the reestablishment of ties between major British lenders and their Iranian counterparts, but according to Lord Lamont, the country’s trade envoy to Iran, complications persist. “The British government wants trade relations with Iran to increase, but banking hurdles have created problems that cannot be separated from politics,” Lamont told IRNA in London. 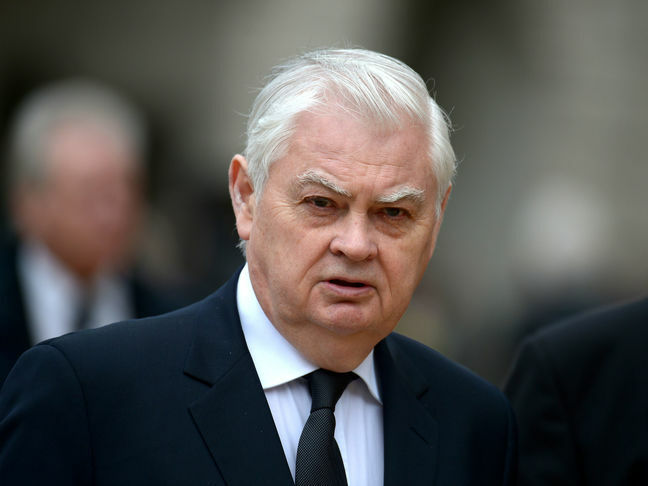 Lord Lamont, who is also the chairman of British-Iranian Chamber of Commerce, noted that the British government has made many efforts for convincing its banks to start establishing correspondent relations with Iranian banks once again, but the British lenders work independently and have yet to heed the calls, Financial Tribune reported. He further said the scope of ties with Iran has been unsatisfactory, because of which he and the British government will continue to make efforts to find a potential resolution of the banking dilemma. However, he does not predict bright prospects in the near future. Since the US president has reconsidered his views on Iran, “until the results do not become clear, it would be unlikely of banks changing their attitude and that is a problem”. Commenting on current trade ties between his country and Iran, Lamont concedes that ties are not yet at a suitable level but have made good progress as they have increased by about 40%. “Small- and medium-sized British companies have expressed their willingness in rekindling business ties with Iran, which is a good sign,” he said, referring to Jaguar’s recent foray into Iran as an example. Months after rumors circulated on the possible entry of Indian-owned British-built Jaguar Land Rover to Iran, the company confirmed in mid-April that it is coming with more than half a dozen new SUVs and sedans. Asked about the recent landmark $4.8 billion deal with French energy giant Total S.A. in early July, Lamont, who has served in many UK departments such as energy, industry, defense and the treasury, said he does not specialize in that field but welcomes the accord. “BP P.L.C. is also engaged in negotiations in oil sectors in Iran and both companies will be active in the country,” he added. On whether British companies would be willing to sign deals as big as the Total deal with Iran, the official said a number of British companies have already engaged in business with the country. Many companies are in the Airbus deal, “Rolls-Royce is very keen on the Iranian market”, Jaguar is coming back and a number of chain stores such as Debenhams have reopened several branches, “all of which point to a rising trend in business activities between London and Tehran”. Considering the uncertainty and doubts about Trump remaining faithful to the Joint Comprehensive Plan of Action, the official name of Iran’s nuclear deal, Lamont was asked about the potential reaction of British Premier Theresa May’s administration should he move to quit the accord. Lamont, who is a former British chancellor of the Exchequer, said he cannot comment on the response of his government with total certainty, but is of the belief that the UK is on the same page as the European Union, whose members support the historic deal. He also talked about the recent round of sanctions imposed against Iran by the US, noting that sanctions have had little effect in the past and have only served to hamper ties between nations. “We must move away from this ungainly trend and do more to have a better understanding of each other by increasing trade and talks,” he said. Recently, the US Senate voted decisively to approve “the Countering Iran’s Destabilizing Activities Act”, which is part of a package that also includes stiff financial sanctions against Russia and North Korea. The sanctions package imposes mandatory penalties on people involved in Iran’s ballistic missile program and anyone who does business with them. The measure would apply sanctions against the Islamic Revolution Guards Corps on alleged terrorism charges. It would also penalize Iran for alleged human rights abuses and also enforce an arms embargo. Iran has adhered to its commitments under the nuclear accord and so “we must be able to employ the full potential of the unique business opportunities in the country”, he said. Lamont concluded that US sanctions must not damage trade ties between Iran and Europe.